CARACTERÍSTICAS DE LA CÁMARA:  TECNOLOGÍA 5MP (2560 X 1944) NOTA: PERMITE CONFIGURAR LA RESOLUCION DE LA CÁMARA: 5 MP / 4 MP/ 2MP, PARA REALIZAR ESTO PRIMERO SE TIENE QUE CONECTAR EN UN DVR DE 5 MP PARA HACER EL CAMBIO A TRAVES DEL MENÚ OSD  CMOS: 5MP SCAN PROGRESIVO.  ILUMINACION MINIMA: ULTRA LOW LIGHT 0.008LUX @ (F1.2,AGC ON), 0 LUX CON IR.  VELOCIDAD DE SHUTTER: 1/30S ~ 1/50,000S  DÍA / NOCHE REAL (FILTRO ICR). 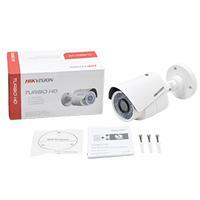  LENTE FIJO: 3.6 MM ANGULO DE VISION 70°  DISTANCIA IR: 40 MTS CON TECNOLOGÍA SMART IR EXIR.  FUNCIONES: AGC, ATW/MWB / BLC / DWDR / DNR / MIRROR / SMART IR INTERFACES:  SALIDA DE VIDEO: TURBO 4.0 HD-TVI. CARACTERÍSTICAS FÍSICAS Y ELÉCTRICAS:  APLICACIÓN: EXTERIOR / INTERIOR.  PROTECCIÓN: IP67 AND #9748; AND #9729;.  TEMPERATURA DE OPERACIÓN: -40 ~ 60ºC  ALIMENTACIÓN Y CONSUMO: (12 VCD - 3.5W)  MATERIAL: METAL.  DIMENSIONES: 86.7 MM X 81.6 MM X 226MM  PESO: 680G.